The 123\FIAT is designed especially for Fiat500- and Fiat126-engines. With a clever design it is made possible to use the existing distributor. No more wear, no more replacement of points, condenser, rotor and cap, EVER again. The advance is now electronically calculated : set it, and forget it! The 123\FIAT is designed to work with a double coil, like our #4240, producing a strong crisp spark, for better starting and economy. The unit offers a built-in LED for easy static timing. All other systems of electronic ignition for FIAT require that the original mechanical centrifugal advance system is still fitted, points – assisted systems even use the original points operating cam which suffers uneven wear and consequent lumpy running of the engine because each cylinder has its own inaccurate ignition timing. Furthermore they all require a separate box for the associated electronics. 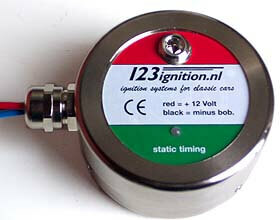 ‘123ignition’ is different, all is contained in one simple module. The points operating cam is removed along with the advance weights and their bearings. Two strong, small magnets slip onto the drive pins which previously held the advance weights, 123\FIAT is like a cap slipped over the emptied distributor-housing. This construction of all the electronics inside an almost original distributor means that there are no unusual wires and connectors leading to a ‘box of tricks’ (other types of electronic ignition have that) which has to be mounted somewhere! So much better than a conventional contact breaker set up because the variable dwell angle ensures a large spark at high engine revolutions, with ‘points’ and of course points assisted ‘electronic ignition’ the dwell angle, controlled by the points gap, remains constant so at high revolutions the coil has insufficient charging time. 123ignition addresses the problem of dwell angle in the basic model – other makes demand that you buy the ‘sports’ version for such performance! So how can 123ignition make an engine smoother? Read on…. A typical ‘FIAT-problem’ is the slightly different ignition timing obtained on each cylinder because of wear or irregularities on the contact breaker cam, 123ignition properly addresses this problem in 2 ways, firstly the cam is removed and secondly that even if the two magnets were not evenly spaced the software within 123ignition converts it into perfect timing. Additionally, because the ‘centrifugal’ advance is now handled by complex software (all within the one simple module) acceleration is unbelievably smooth but particularly so in slow running in traffic,(from 1000rpm to 3000rpm) this is far better than with conventional ignition where the weights are constantly adjusting in traffic – with any wear in the bearings the advance curve is not even. -simple installation without mechanical adaptations. -no maintenance – ever again! -variable dwell angle to prevent low speed overheating of ignition coil and better spark at all speeds. -16 different advance-curves, ideal for tuning purposes. -no burning out of the ignition coil (after stopping the engine power is cut to the coil after 1 second!). -built in LED for simple static ignition timing.